A Little Off-Color Humor, Anyone? "Damn glad to meetcha. Hey...WHAT THE...????" Since President Obama is usually on the receiving end of their scorn, when the Republicans gathered in New Orleans last week for a conference someone must have thought it might be a nice change to mock him instead. So some genius decided to hire a Obama imitator named Reggie Brown to do a send up of America’s first Black president. Was a Republican political conference different from the stuff you usually do? I normally do corporate comedy, so I’ll travel around and do everything from medical associations to lawyer groups, things of that nature. This was the first major political event I’ve ever been invited to, so I was real excited to get up and perform my material. I thought it was cool that a lot of the people in my act–the candidates–were going to be there. Because my latest material is based on the 2012 candidates, and for them to all be there, I thought it would be a great opportunity to make ’em laugh and poke a little fun at them. I thought that showed a lot for the Republican sense of humor. Did the organizers give you any guidance about what type of humor they were looking for? No, no guidance was given prior to the show. They booked me to come down based on my website and the links my manager forwarded them of my recent work. I was booked to do my routine. What was your intention going in? Seemed like you tried to kind of hit every target, Democrat and Republican. Oh yeah. Our show is designed to be fair and balanced. If we hit the Republicans we hit the Democrats, and then the Tea Party. We want to make it accessible to everyone, and let everyone have a good time. So walk me through what happened out there on stage? What was your point of view? "Stop me if you've heard this one. Two Republicans walk into a bar..."
So I came out and was going through my material. I was loving it, the audience was loving it–great energy. We’re feeding off each other. And I started to get into my set about their candidates for 2012, and the Mitt Romney joke drew a lot of ‘oohs’ and ‘aaahs,’ but also a lot of applause and laughter. I delivered a couple more on Pawlenty and Gingrich, and then as I started into my Michele Bachmann joke and her PowerPoint slide came up on the screen, the music came up. I thought it was a technical error, because we do occasionally experience a glitch with the PowerPoint. Then the mike cut out, and the gentleman came on stage and told me my time was up. Did they indicate that they were unhappy with your performance? What did he say? No, not at all. He just came out and said, ‘Sorry, your time’s up.’ I thanked the audience, went backstage, and a few of the organizers were saying, great job, very well done, we’re all excited for you. I left the stage feeling like I’d done a great job. It was awesome, it was great. There have always been comedians who imitate presidents. White comedians from Rich Little to Dana Carvey have been well paid to do impressions of Richard Nixon, Ronald Reagan Bill Clinton and both Bush presidents. Now we got a problem because a brother is trying to make a buck off of doing Obama? Maybe Brown isn’t that funny and he isn’t. His jokes are a little on the lame side, but there’s a difference between not being funny and catering to White racism. As long as he doesn’t cross that line, I got no problem with Brown. Whether or not Brown’s hustle is making White conservatives laugh about a Black conservative, that doesn’t mean he’s standing up there with a bucket of KFC extra crispy and a .40 ounce pretending he’s the president. Whenever it is said you can’t make fun of President Obama because he’s the first Black president, we are saying he has to be treated “special.” Politicians are subject to be mocked and Obama is a politician. He can take a joke and so should everybody else as long as it’s not malicious or pandering to bigots. Comedians have always made fun of politicians and they always should. The screw-ups of puffed-up politicians are a fertile gold mine for jokers. Contrast that with Herman Cain whining like a little beeyotch because Jon Stewart made fun of him after Cain said as president he wouldn’t sign any bill longer than three pages. "Five chicken dinners? Over here, buddy!" I love it when Black conservatives play the race card. Their hypocrisy is so delicious. The Herminator needs to get a X-ray for his funny bone. It’s Jon Stewart for Godfather pizza’s sake! He didn’t make fun of Cain because he’s a Black conservative. He made fun of Cain because he’s a fool that happens to be Black. Getting a giggle out the screw ups is what a comedian does. Cain should realize Stewart is an equal opportunity offender so come on Herman. Put on your big boy Pull-Ups and get over yourself. 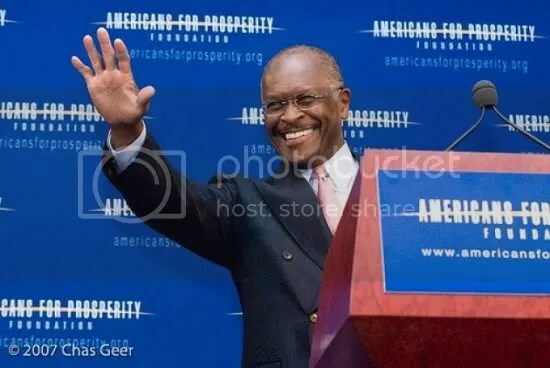 Somewhere in America there’s a brother working on his humorless Herman Cain impression. Maybe Reggie Brown is looking for a partner?